Apply Online - Welcome to our Quick and Easy Secure Online Application! 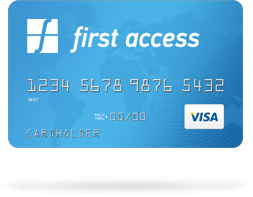 I have reviewed the Electronic Communications Disclosure and consent to the use of electronic records and signatures in connection with my First Access credit card account. I further acknowledge that (1) my computer satisfies the hardware and software requirements specified in the Electronic Communications Disclosure, (2) I am able to electronically access the www.firstaccesscard.com web site and to electronically access and print the electronic communications you will be providing to me, (3) I am able to view and download the PDF disclosures above, and (4) I am able to receive electronic communications at the e-mail address I provided to you. I decline (if you do not want to accept now, you will be returned to the homepage and will have the opportunity to accept at a later date). The USA PATRIOT Act is a Federal law that requires all financial institutions to obtain, verify and record information that identifies each person who opens an account. You will be asked to provide your name, address, date of birth and other information that will allow us to identify you. We may also ask you to provide identifying documentation. A checking or other transactional account at a US financial institution will be needed in order to make these monthly payments.